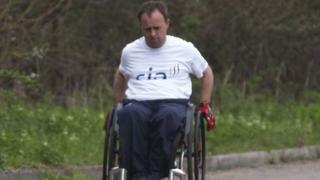 Ian Hosking tells BBC Sport why he wants to mark 10 years of being in a wheelchair by completing the London Marathon. Ian, who was paralysed in a car accident, will be one of the first people to take part in the 26.2-mile event in a day wheelchair, as opposed to the elite wheelchair used by the likes of Paralympic champion David Weir. If you have been inspired to attempt the London Marathon, you can find out details of how to register for next year's event here.